2019 is your year to live your best life! 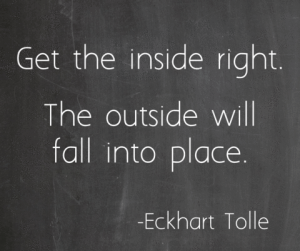 To own your best in mind, it’s critical to own your best in body and health too. While we strive to give you the life strategies to thrive, staying in the best physical shape possible begins and ends with you! Yes fitness and exercise are priceless, but we get that a price needs to be set. Since a gym membership may not fit into your life or budget, we’re reviewing the most recommended and top picks of the best home gym under $500 on the market today. Why Review the Best Home Gyms on the Market for Under $500? So we don’t always have the gift of time to simply run to the gym. Plus gym membership fees seem to be ever increasing while you deal with crowds of people utilizing the limited machines. For me, I like the privacy of cranking up my music and not worrying about anybody criticizing my form. Anyway, included in budgeting our time and money, there’s work, family, finances and everything else going on demanding our time. For many it’s so much more convenient to get that quick conditioning workout in at home. Another super important thing to realize the positive impact of exercise, whether it is from working out or simply going for a brisk walk, on improving mood and emotional health. Consistent physical exercise promotes the brain chemicals (called endorphins) necessary to bring down stress and anxiety, and raise up your mood. So not only do you work out to improve your body’s physical health and appearance, but it’s positive effects on self-esteem and emotional well-being are absolutely critical. With all that said, know that owning a multifunctional, top notch gym system in your own home (especially under $500!) doesn’t have to break the bank. We know there can often be hesitation in investing in a home gym because these systems can get really expensive. It can also feel overwhelming at first when there are so many to choose from and most appear rather complex to use. Even the most expensive and best of home gyms can be rather complicated to navigate around. But we promise, these are not only simple to use, these home gyms, all for under $500, are the best systems out there for a variety of reasons. So while we don’t all have the luxury to buy a super expensive home exercise equipment, know that there is something out there for everyone. We’ve researched the market’s best home gyms under $500 that not only give you the best bang for you buck, they leave you in the best shape of your life. The Gold’s Gym body building brand is legendary in terms of affordable and effective weight-training and conditioning systems. But of course we don’t judge by name. Gold Gym XR55 highly regarded reputation and longevity in the bodybuilding, health and fitness industry has been earned because of the quality of what they produce. 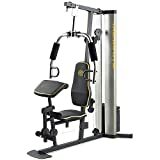 The Gold’s Gym System is competitive and comparable in many ways to Marcy Home Gym. And unlike it’s XRS 50 brand and the Weider 2980 Home Gym, this gym has an adjustable seat and 330 lbs of resistance. It’s also important to not that this system features high quality materials and comes with 125 lbs weight stack. 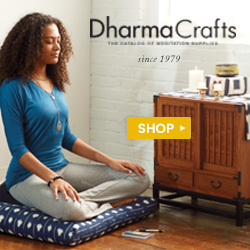 It’s dimensions assembled are: 77L x 43W x 82.5H inches. Why you may not go with this one: If you’re looking to assemble alone, most of the reviews recommend using two people. However, assembly instructions are said to be thorough and easy to understand. Okay so the Bowflex is at the high end of the “under $500” range for the best home gym, but with very good reason. How many at home gym systems have the versatility of a built-in rowing station? The Bowflex PR1000 Home Gym System effectively strengthens muscles while adding some aerobic cardio training to your workout. Bowflex uses a cable pulley resistance system which makes workouts extremely flexible and customizable. All this functionality while not having to deal with free weights. The pulley system is super effective because it allows you to target muscles in depth and work every angle. Bowflex features over 25 strength exercises using top quality materials. There’s so much more to this system, so check out it’s list of details and reviews on Amazon. Highlights: The pulley cables specialized for resistance training while providing all the basic necessities for a meaningful workout. What we like most: Did we mention the rowing machine feature?! Why you may not go with this one: Preference. Some may want the visual effect and/or stability feel of using a weight stack. Hey if it works for Chuck Norris…. Seriously, Total Gym is another valued name in the home gym and fitness world. While Gold’s and other workout systems have their manuals and exercise books, Total Gym provides you with these awesome extra goodies: a Total Body Workout DVD, an exercise flip chart and a nutrition guide. While the machine doesn’t look multifunctional, it has plenty to offer. 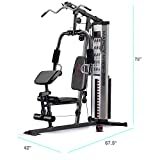 Priced well-below our $500 price-point budget, Total Gym still manages to give you over 60 different exercises, including cardio, strength training and stretch all on this one system. Because theTotal Gym 1400 Deluxe is so versatile, it simultaneoulsy strengthens and tones multiple major muscle groups. 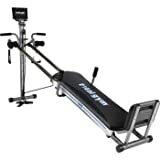 Highlights: The Total Gym 1400 is resistance based and has a glide bench which reportedly is appropriately named. What we like most: Arrives fully assembled and it folds up quickly for convenient and easy storage…WOW! Why you may not go with this one: Not likely the best home gym for the advanced bodybuilder. Also, it’s reported that the glide board may be too narrow for a fuller sized bottom. There’s so much to talk about with Marcy’s at home workout system. Not only is this Home Gym Station model a culmination of quality, fitness and value, Marcy offers a few other models (like the MWM-988 which is a little less money due to some cosmetic tweaks) to work with discriminating budgets. This particular model (MWM-990) is their top seller for good reason. It’s made with heavy-duty steel tubing and reinforced with guard rods that hold weight in place during workouts – so this system is built to last. It has a 150 lb adjustable and customizable weight stack so you can set it according to your skill level. This also allows you to avoid the stresses of loading and unloading weight plates with a safety lock. Highlights: Under $500 budget friendly for the multifunctionality of this entire system. Pulleys and cables are connected to the weight stacking for a smooth and controlled body exercises, so you don’t need to load and unload weight plates. Take a look at this manufacturer video for a better look of the Marcy home gym in action. Why you may not go with this one: Alot of the reveiws on Amazon talk about the challenges of assembly, so this may be either a phone-a-friend or outsourced job. 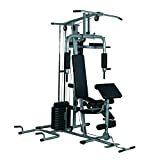 Weider Total Body Works 5000 Gym machine is comparable by design and function to some of the Total Gym models (ie.1400 and XL7). 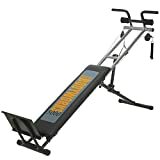 The Weider 5000 gives you and effective yet challenging worksout regardless of your fitness level for several reasons. The machine uses your own body weight, in conjunction with four adjustable power bands. The four power bands are meant to increase weight resistance up to 50 lbs beyond your own weight. So if you need to take it up or down a notch, you can easily add or reduce your workout’s intensity. Finally there are seven different incline settings on the glide seat board available to select from. Highlights: Weider Total Body provides you with a simple yet really versatile, compact and effective workout system for a reasonable cost. Collapses and quickly slides away for easy and convenient storage. Why you may not go with this one: Not the optimal choice if you’re looking to build muscle mass. If you never thought it was possible to to afford a home gym system for under $500, I hope you found value and inspiration in our product reviews. When it comes to your health and personal fitness goals, the investment you make on the best home gym for you quickly outweighs years of unused gym memberships. A home gym is a highly effective way to not only increase muscle strength, and condition your body, it’s an equally important way to own both your physical health and emotional well-being. Plus it doesn’t hurt to get as much bang for your buck! 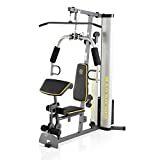 So if you’re searching for a home gym under $500, you’ll see there’s a substantial selection of quality products from which you can consider. Whether you need to let privately off steam in the middle of the night, commit to dropping a few pounds here and there, build muscle strength, maintain stamina, save money on a gym membership, a home gym will be there indefinitely to fulfill those needs. exercise, fitness, health, home gym, Reviews. Bookmark.